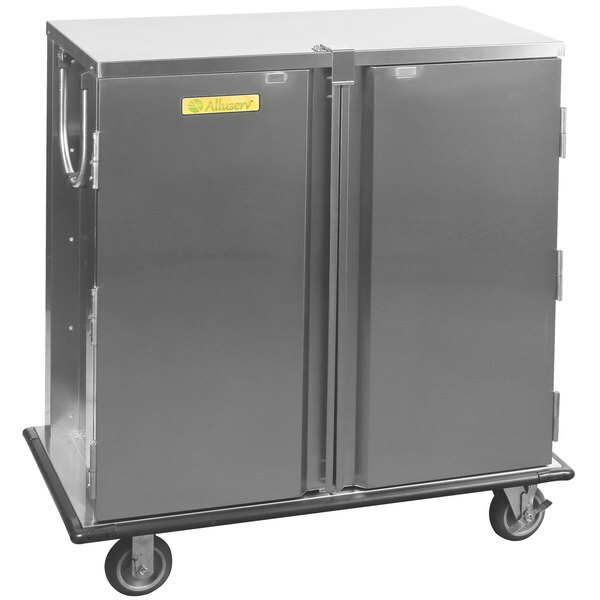 Delivering plated meals in a healthcare facility or trays for room service at a hotel is a challenge made easy with this Alluserv TC12-14 Elite 14 tray single door meal delivery cart! This cart has the ability to hold up to (14) 14" x 18" or 15" x 20" trays full of meals so you can serve your patients and guests as quickly and efficiently as possible. Featuring (4) 6" casters, 2 with brakes, as well as U-shaped push bars on both sides that are recessed to protect the operators' hands, this unit can be easily pushed or pulled around corners, through hallways, and into elevators. Plus, its full perimeter bumper protects walls and furnishings during transport. This meal delivery cart is made of durable, corrosion-resistant stainless steel to allow for simple cleaning and sanitation. In addition, it has a single door that opens 270 degrees and stays open with magnets for easy access during serving. Then, when it's time to move it to another location, simply secure the transport latch to keep the door securely closed while the unit is in motion.